Well, nearly a year after starting out last time, here we go again, setting off on our long distance walk, 192 miles ahead await – adventure here we come!!!! 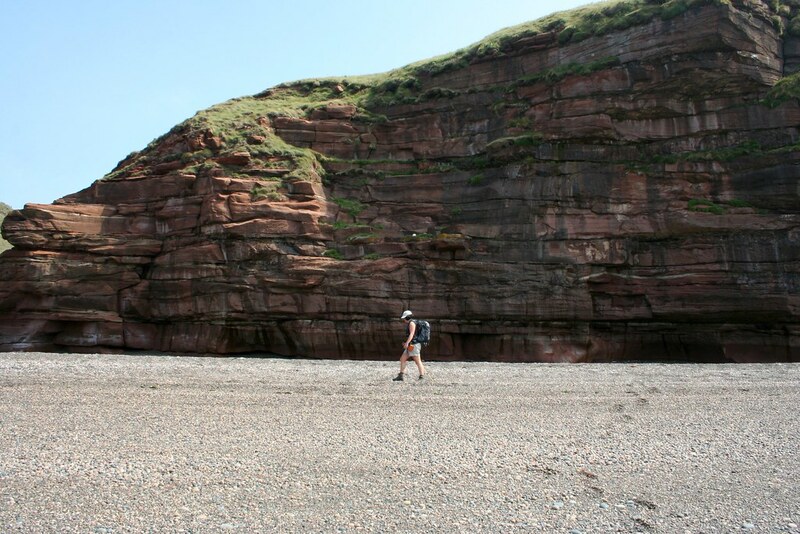 After being picked up at Kirkby Stephen by Packhorse, we were dropped off at St Bees. The weather was absolutely gorgeous – hot and bright blue sky. Day - trippers looked on bemused as our walk started with the traditional trip down to the sea, luckily this year the tide was in and it was only a short walk over the foreshore to dip our toes in the Irish sea - then came the serious challenge of choosing the pebble (or in my case 3) to carry with us on our journey. Off we went uphill to St. Bees Head. There were various people around us heading in the same direction – who else was also setting off on the C2C? We made height quite quickly. I was relieved – my legs were not hurting – a good sign! Soon heading along the coast path before walking down towards Fleswick Bay. This is a very pebbly beach. There were 2 people on the beach looking out seawards with binoculars in hand watching the seabirds. As we looked up we noticed a sea mist drifting in. By the time we got back to the top of the cliffs visibility was poor making it impossible to see very far and the two birdwatchers became blotches in a grey landscape. Mist swirled around the lighthouse, a distant blur as we went past and a sign of things to come. The sea mist soon cleared and visibility improved. All too soon we were heading away from the sea and striding out towards Sandwith – 5 miles covered already! After Sandwith, we crossed through fields, coming across our first Coast-to-Coaster – a young American girl whose name we could never catch. 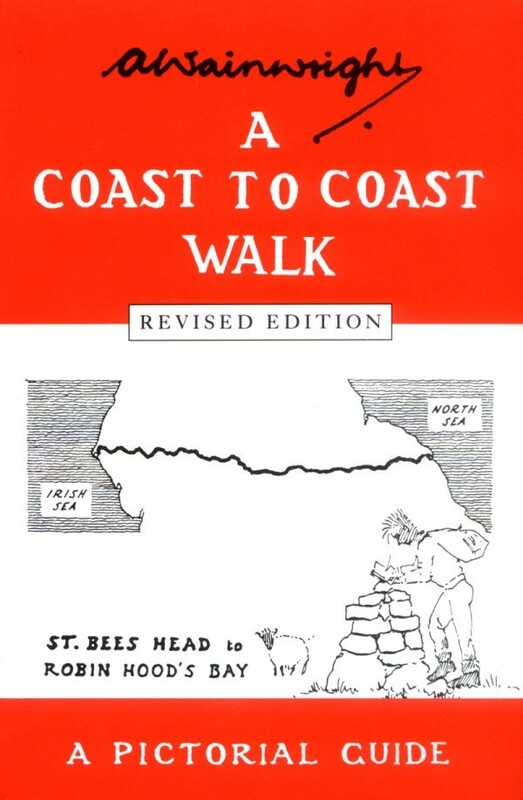 She was backpacking, wearing trainers and a short skirt – religiously following Henry Stedman’s book. She was a little confused by the directions though and at a junction of paths unsure of which one to take - one of the drawbacks of just following a book. Hesitantly she followed us as we looked at the route on our maps and decided that the path she was initially going to take, the one we were following, was the right one. A bit further on, as we followed our plotted route on the map she called out, stopping us from walking into a wood, pointing out a signposted path, one of the drawbacks of not following signs! A short distance later our route turned off the main track to follow some steps up the side of a bridge leading on to a disused railway track. The American Girl followed us and then quickly turned back exclaiming that “it was not in the book” and she wanted to stick to the route (even though this alternative route is mentioned – and in fact even recommended – see page 73). We followed the track, turning off where the sign post recommended you should rejoin the guide book route. At this point last year I was convinced that we had continued further on the track, completely bypassing Moor Row but Kev swore blind that this was where we had turned off last year. Guess who was right! Yes, me! So, we came out on a dreary road at Moor Row – following a group of French walkers and the American Girl, through some kissing gates (which was great fun, as we are great traditionalists at kissing gates! ), before crossing the dismantled railway again. See no need to leave it in the first place! Then continued down until we arrived at Cleator. Ahead of us was the long climb up Dent. It was with relief that we reached the summit - just behind a guy wearing full army combat gear and a large rucksack. Another Coast-to-Coaster? Another Nigel from 2007? Nope, after a quick rest and a chat into his walkie - talkie, he was soon striding back down the hill. We were reliably informed by two other walkers that he did this route every week, always getting to the summit at the same time. How did they know we wondered? By now a Canadian couple had reached the top of Dent having overtaken the French group, who we had seen resting by a gate at the foot of the hill but never saw again. The very steep descent to Nannycatch Beck was ahead. Using both trekking poles and this time knowing we were going the right way, I found it a lot easier going down this time. The American Girl easily skipped down, which was quite amazing looking at the size of her rucksack, whilst the Canadian Girl went down backwards – a novel approach. Kev and I decided to miss out on the “false” stone circle of Kinniside and avoid some road walking. Our path stayed in the valley below the road coming out at a farm track where we turned right up to get back to the main road. Resting by a cattle grid, enjoying the sun, we started to wonder where the American Girl and the Canadian couple had gone to, surely they couldn't have found the imitation stone circle that captivating? They finally turned up, having decided to follow us along the path but reading the instructions in the book. When they reached the farm track they thought this was the road referred to in the book so following the book’s instruction they turned left, but on the wrong road – oops! Swearing never to follow us again. They headed off. As we were in no rush to get to Ennerdale, the pub doesn't serve food until 6 pm we stayed sitting by the cattle grid – enjoying the sun. 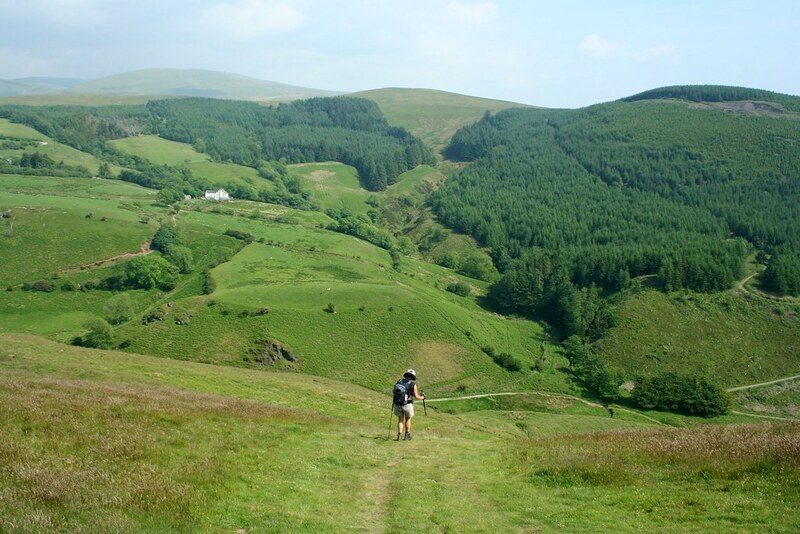 A lone walker came over the hill – another backpacker – and another American – a Texan called Todd. We spoke for a while before he set off. Our B+B was a few miles uphill from Ennerdale Bridge so, we had already decided to stop at the pub for dinner before going on to Kirkdale. It was still warm when we arrived at the Shepherd’s Arms Hotel so we took advantage and sat at a bench to the side of the pub. At the next table was a friendly Scouser and his mate, and a dog. The dog evidently was entrusted with ensuring that one of the guys didn't drink more than two pints, any more and he starts barking. Todd had joined forces with the American backpacker. As the Ennerdale village campsite had now closed, they would make their way to Moor End instead to camp. We put in our food order: Omelette and chips for me! And moved to the back garden to enjoy our food. 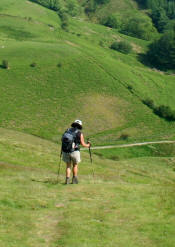 I looked around the fellow drinkers and wondered who else were walking the C2C. One guy looked in agony as he went to order some more drinks from the bar. 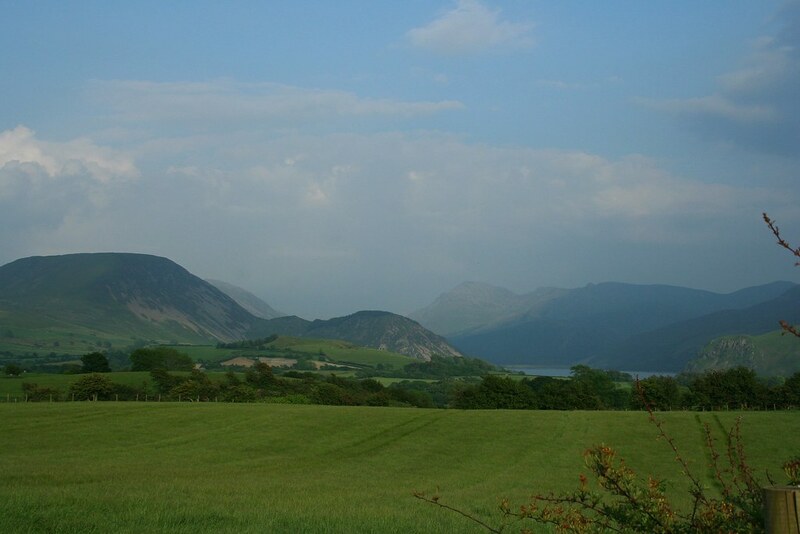 As the sun started to fade we headed up the hill to our B&B – Ennerdale View. A very pleasant welcome awaited. It was good to see the owners again – and their dog which was very playful. Sitting in the back garden with fantastic views towards Ennerdale Water we started talking to a couple who were climbing all the 'Wainwrights' - that is every hill or fell noted in every volume of his guides - they only had about 9 left to climb. They obviously liked the B&B and said that it made a change arriving at a place dry. Not sure if I agreed with their policy of drying clothes in their B&B room though instead of using the normally provided drying room “in case it ruined our clothes”, preferring instead to ruin the bedroom they were in. We were hoping to watch the final show of Joseph on TV - sadly although we had BBC1, the TV had a sound fault, all we could hear was a high pitched squeal which for all we know may have actually been the hopeful Josephs singing - with the sound turned off it made interesting watching as they mimed through the musical. Still I was happy, my favourite, Lee, won.